A global musical phenomenon, Wicked, has taken to the road for its first UK and Ireland tour and the Production Resource Group (PRG) is providing a custom-built automation solution and the full lighting system. The show opened at Manchester's Palace Theatre to five star reviews and plays until 16th November when it will move on to Dublin. PRG is no stranger to the show, having supported the US tour since 2004. PRG supplied a bespoke designed automation package for the production. For expediency the system used was set-up in its entirety in PRG's testing facility in New Windsor, New York prior to shipping to the UK. 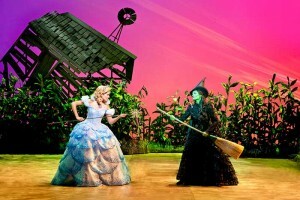 This enabled Wicked's creative team to pre-approve scenic moves, which saved valuable time in the theatre. To support its UK installation John Galante, systems manager for PRG, joined the PRG and Wicked's technical team at Manchester Palace Theatre. Here he provided technical back up and system training for the touring technicians. "There are 14 automated effects on this show," explains Galante. "This system comprises the PRG Commander Console, a safety-rated logic controller, and our next-generation AC servo drive racks. The drive racks are custom tuned to control a wide variety of motorised effects and contain either eight 3kW drives, or two 7kW drives. We pair the servo drives with digital motion controllers for closed loop control." In addition to the control PRG has provided power distribution, UPS backup, and a hydraulic pump for the Witch's Levitator. "The system was designed with safety in mind," continues Galante. "Redundancy and monitoring is combined for E-Stops and Interlocks. It's a SIL-rated system; programmable Cat 1 E-Stops are standard. The system also provides the benefits of servo control and effects can be positioned within hundredths of an inch and the Commander console enables production to program the show using time and/or velocity-based cues, offering more flexibility when cueing the show." "The PRG Commander console combines the power of the cue-based PRG Stage Command System software with 3D graphics, faster processing and an intuitive user interface," adds Ben Lampman, ﻿﻿project manger at PRG Scenic Technologies. "It's an ideal control solution and provides a powerful hardware and software platform that is reliable, accurate and really user-friendly." Original lighting designer, Tony Award winning Ken Posner, assisted by UK associate designer Alistair Grant and US associate Karen Sphan, returned to the UK to re-light the dynamic and vibrant show: "We were keen to keep the feel of the original UK production," he explains. "However, we have revisited certain elements creatively. There are new flying sequences and some re-dramatised scenes. When it came to designing a touring lighting package we had some new ideas plus we considered constraints including time, money and truck size." Posner and Grant worked in collaboration with PRG's account director, Peter Marshall and production electrician Peter Lambert to reduce the rig size without having to compromise Posner's creative ambitions. They found that replacing the conventional cyclorama solution with LED battens considerably reduced the number of fixtures required. Posner's rig also includes: VL2500 spots, VL2500 washes, VL3000Q spots, ETC Source Fours, Robert Juliat followspots, Wybron Coloram II scrollers. The control consoles are EOS TI, ETC Gio and ETC ION along with two additional fader wings and dimming comprises four Avolites ART-2000 48-way dimmer rack and two ETC 12-way Smart Racks. 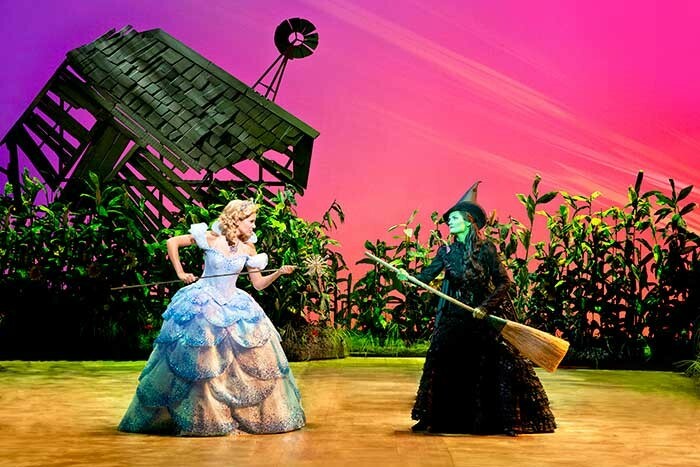 With the current tour of Wicked, PRG continues its incredible success within theatre, following its work on shows including Book of Mormon and Once in the West End, Chimerica's transfer from the Almeida to the West End, and UK tours of Cats, Priscilla, and Ghost. 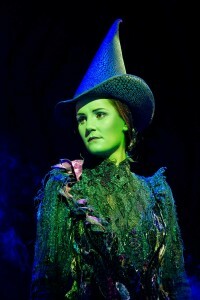 The Wicked UK and Ireland tour began at Manchester's Palace Theatre on the 12th September 2013 and reaches the Bord Gáis Energy Theatre, Dublin on the 27th of November 2013.